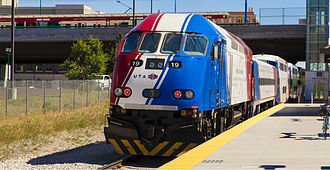 Amtrak service is provided with a bus connection running to/from Salt Lake City, where there are daily California Zephyr trains west to the Oakland, California area and east to Chicago, Illinois. Amtrak trains do not serve Ogden directly. 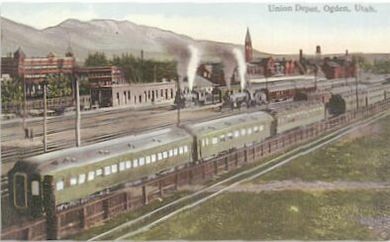 Historically, Ogden Union Station served as a hub for frequent trains going northwest to Oregon and Washington, and east to Chicago. 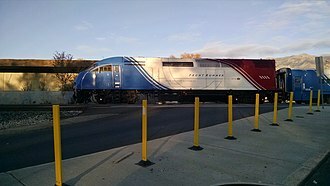 Amtrak ended the Pioneer in 1997. Ogden-Hinckley Airport, Utah's busiest municipal airport, is in the southwest portion of the city. Allegiant Air offers commercial service from Ogden to Phoenix and Mesa, AZ. Utah Airways offers charter service to many of the West’s national parks. ^ "Ogden Utah Temple News". www.ldschurchtemples.com. Retrieved 2016-01-02. ^ a b "NOWData - NOAA Online Weather Data". Archived from the original on 2006-10-07. ^ "Ogden Pride Festival". Ogden Pride Inc. Retrieved 16 September 2015. ^ "1st Annual Ogden Pride a Fun Time!". Salt Lake Pagan Society. 1 August 2015. Retrieved 16 September 2015. 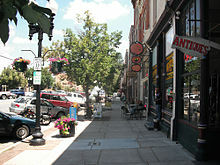 ^ "Best Places For Business and Careers - Forbes". Forbes. Retrieved 15 January 2014. ^ "About". FlyOgden. Retrieved 2016-01-03. The Ogden Utah Temple is the sixteenth constructed and fourteenth operating temple of The Church of Jesus Christ of Latter-day Saints. Located in Ogden, Utah, it was built with a modern. 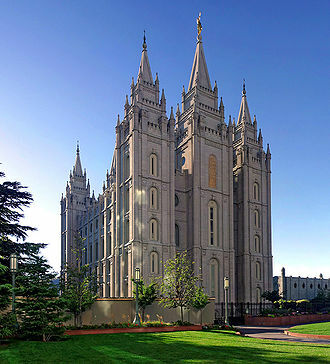 During a renovation completed in 2014, the exterior and interior were extensively changed, the temples in Ogden and Provo were planned due to overcrowding in the Salt Lake and Logan temples. 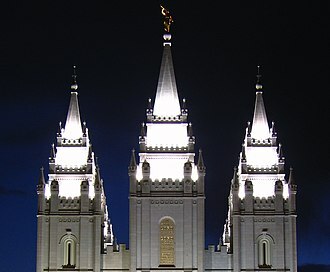 The Ogden Temple serves more than 135,000 members, the intention to construct a temple in Ogden was announced by the LDS Church on August 24,1967. On September 7,1970, a cornerstone laying ceremony was held, the site for the temple is a 10-acre lot called Tabernacle Square that the church had owned since the area was settled. In 1921, LDS Church president Heber J. Grant inspected the site as a temple site. 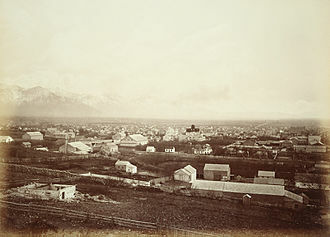 At the time of construction, the Ogden Temple differed from temples built previously by the LDS Church, the original design was very contemporary and the lot chosen is in downtown Ogden, surrounded by businesses and offices. The temple in Ogden was the first built in Utah since the Salt Lake Temple was dedicated in 1893, the Ogden Temple was originally constructed with 115,000 square feet and four floors, one below ground. The temple included six rooms and eleven sealing rooms. The stone on the temple was fluted and decorative metal grillwork was added between the stone, gold windows with directional glass added to the beauty of the temple. The Ogden Temple was dedicated on January 18,1972, by church president Joseph Fielding Smith, beginning in 2001 and lasting through much of 2002, both the exterior of the temple and the surrounding grounds underwent significant changes. Weather damage to the exterior of the temple was repaired and the spire, a fiberglass statue of the Angel Moroni covered in gold leaf was added to the temples spire, almost 30 years after the temple was dedicated. The temple grounds received walkways and paths allowing visitors to walk around the temple as well as to access the structure from the adjacent street. Weber State University is a public university in Ogden, United States. It is a coeducational, publicly supported university offering professional, liberal arts and technical certificates, as well as associates, Weber State University is accredited by the Northwest Commission on Colleges and Universities. Programs throughout the university are accredited as well, the school was founded in 1889 as Weber Stake Academy, changing names to Weber Academy, Weber Normal College, and Weber College. Weber College became a college in 1933, and in 1962 became Weber State College. 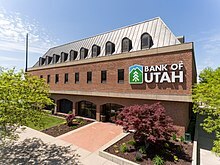 It gained university status in 1991, when it was renamed to its current name of Weber State University, Weber State University was founded by The Church of Jesus Christ of Latter-day Saints as the Weber Stake Academy in 1889. 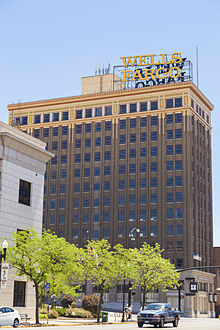 Weber comes from the name of the county where the university is located, Weber County was named after John Henry Weber, an early fur trader. The university opened for students on January 7,1889 with 98 students enrolled for classes, the first principal of Weber Stake Academy was Louis F.
Moench. He served from 1889–1892 and again from 1894–1902, in the latter year, Moench was succeeded as principal by David O. McKay who served in that position until 1908. From 1914–1917, James L. Barker was the principal of the Weber Stake Academy, in 1931, the Utah Legislature passed a law providing for the acquisition of Weber College and Snow College from the LDS Church. In 1933, Weber College became a junior college. In 1954 the college moved from its location in Ogden to a spacious. The school became Weber State College in 1962, and in 1964 became a four-year college, on January 1,1991, Weber State was upgraded to university status. Weber State University has developed into a major state undergraduate institution serving northern Utah and areas beyond, including American, Weber State University sits along the east bench of the Wasatch Mountains in Ogden, Utah. The Dee Events Center is located about 1 mile south from campus, there is an additional campus located in Davis County and two centers located in Morgan and Roy, Utah. The rail line was built by three private companies over public lands provided by extensive US land grants. 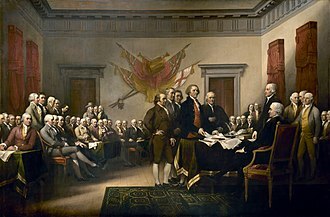 Construction was financed by state and US government subsidy bonds as well as by company issued mortgage bonds. 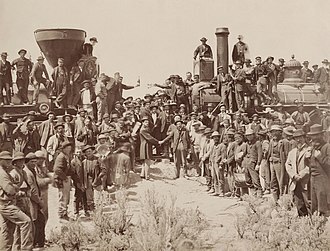 The Western Pacific Railroad Company built 132 mi of track from Oakland/Alameda to Sacramento, the Central Pacific Railroad Company of California constructed 690 mi eastward from Sacramento to Promontory Summit, Utah Territory. And the Union Pacific built 1,085 mi from the eastern terminus at Council Bluffs near Omaha. 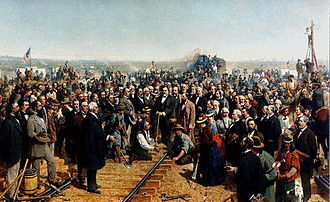 The railroad opened for traffic on May 10,1869 when CPRR President Leland Stanford ceremonially drove the gold Last Spike with a silver hammer at Promontory Summit. 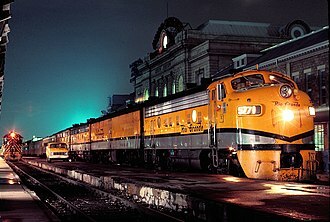 The coast-to-coast railroad connection revolutionized the settlement and economy of the American West and it brought the western states and territories into alignment with the northern Union states and made transporting passengers and goods coast-to-coast considerably quicker and less expensive. Paddle steamers linked Sacramento to the cities and their facilities in the San Francisco Bay until 1869. 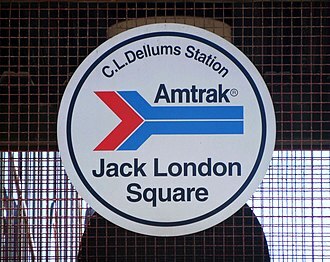 The roads rail terminus was moved two months to the Oakland Long Wharf about a mile to the north, Service between San Francisco and Oakland Pier continued to be provided by ferry. 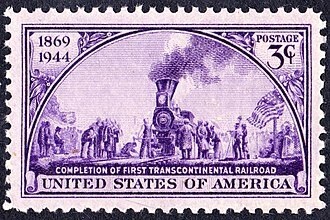 The CPRR eventually purchased 53 miles of UPRR-built grade from Promontory Summit to Ogden, the transcontinental line was popularly known as the Overland Route after the principal passenger rail service that operated over the length of the line until 1962. 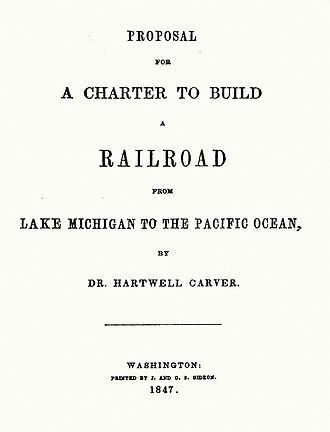 In 1847 he submitted to the U. S. Congress a Proposal for a Charter to Build a Railroad from Lake Michigan to the Pacific Ocean, Congress agreed to support the idea. Under the direction of the Department of War, the Pacific Railroad Surveys were conducted from 1853 through 1855 and these included an extensive series of expeditions of the American West seeking possible routes. 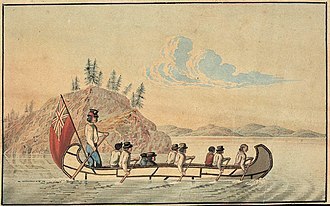 A report on the explorations described alternative routes and included an amount of information about the American West. It included the natural history and illustrations of reptiles, birds. Fort Buenaventura was the first permanent Anglo settlement in the Great Basin. 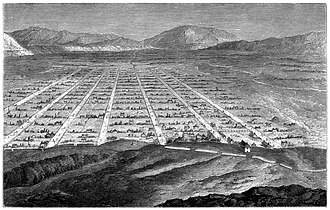 It was founded in 1846 just east of the Weber River, west of current downtown Ogden, the fort and the surrounding land were bought by the Mormon settlers in 1847 and renamed Brownsville. The land on which the fort stood is now a Weber County park. 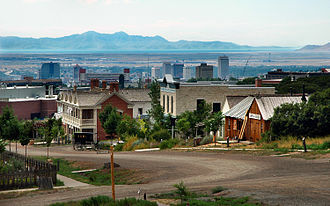 Fort Buenaventura was the first permanent settlement by people of European descent in the Great Basin and it was established by the trapper Miles Goodyear in 1846 about a mile west-southwest of the present-day Ogden municipal building. 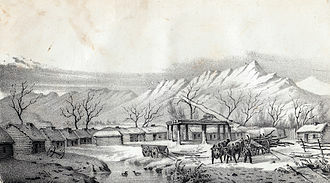 The fort was located east of the Weber River, at a bend in the river, the purpose of the fort was to serve as a trading post for trappers and travelers. 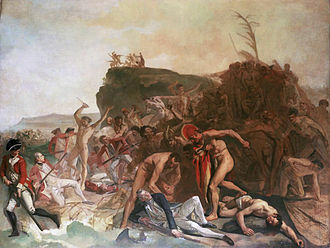 In November 1847, Fort Buenaventura and the land claim were purchased by the Mormon settlers for $1,950. 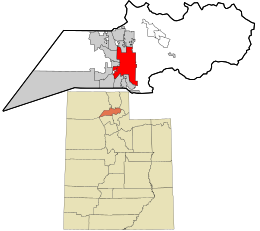 The settlement was renamed Brownsville, but was changed to Ogden after Peter Skene Ogden who trapped in the Weber Valley. The site of the original Fort Buenaventura is a park occupying 84 acres, when made a park, it was originally a Utah State Park, but is now a Weber County park. Belegarth Medieval Combat Society's annual battle at Fort Buenaventura on 13 October 2007.